In Hemja, a village next to Pokhara, is the Tashi Palkhiel Tibetan Camp, a Tibetan refugee camp that has been established for more than 50 years and currently houses more than 800 people. This field was started by the Swiss Red Cross with the authorization of the Nepalese government. Within the camp is the Mount Kailash School Tibetan school. 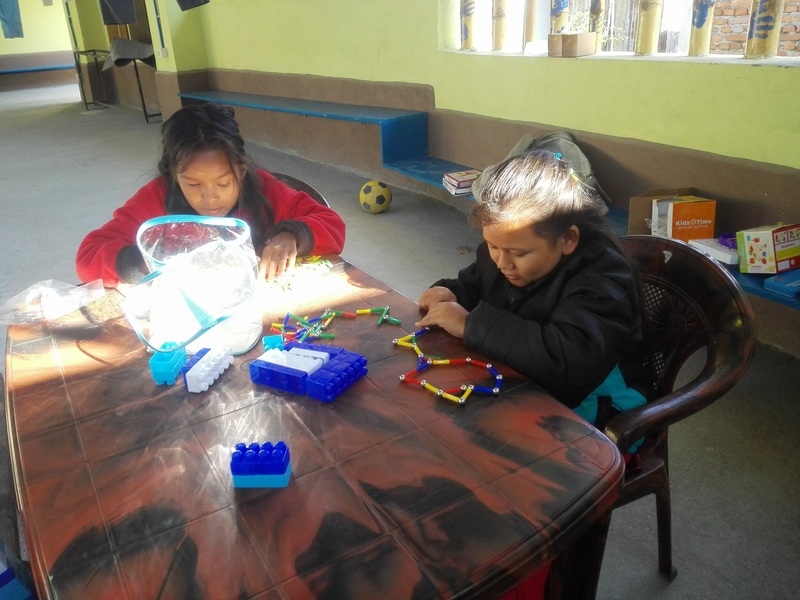 Through the Tibetan school in Kathmandu we contacted the school’s head of studies, Mr. Tenzin. With him we agreed to hold 3 theater workshops for the 6th, 7th and 8th grade classes, equivalent to 12, 13 and 14 years, and a performance for the whole school. On the appointed day we headed to Hemja in the morning on the local bus, surrounded by Nepalese observing us with sleep and curiosity. This bus goes to the mountains, and crosses villages that do not see many tourists or travelers like us … Once there, we asked the locals to go to school. 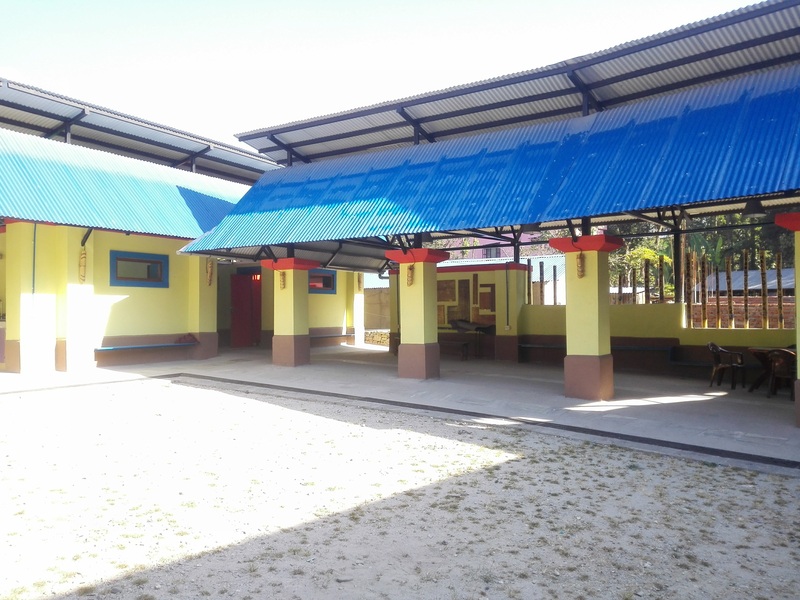 As usual, the school consisted of a large esplanade with nothing, and two elongated one-story buildings composed of several rooms that were classrooms. We were pleasantly surprised by the science classroom with a showcase with chemical reagents, a skeleton and some microscopes. We would act after the traditional morning assembly, where some prayers were recited, the Tibetan hymn was sung and then the Nepalese anthem, which is familiar to us, we even found it catchy. We assigned the captain of the students the work of sound technician, and his partner in charge of the camera … the two took it very seriously … hehehe. Once prepared, dressed and made up, we started the show … there were about 100 students, waiting for us, eager to see the clowns … Only appear and the first laughs appeared, they were very motivated! The number was great, everyone laughed, they died of laughter, and of fear when we interacted with them, the volunteers crowded, they wanted to play with us !!! It was a pleasure for the public, a gift to be able to share this experience with them. Once finished, they rushed to shake hands, to play with us, to talk, to share more! But we had to go to change, soon we started the workshops. The workshops we did in the library. A classroom full of books for all ages with messages on the wall that encouraged reading. Before the students arrived, we cleared the room a bit so that it was free of obstacles. They chopped the first ones, they took off their shoes before entering the room, as is customary throughout Asia. We introduced ourselves and explained a little about clown, the questions rained, they were very interested. The workshop passed fantastically, they loved to go out and experiment and see their colleagues expose themselves, surrender to the group. It was a pleasure to share the experience with students so motivated, dedicated and generous. A love of people who did not stop asking questions, about our training, about our experiences throughout our trip, and about clown … a pleasure to share with such generous people. Tibetans have something that makes them more innocent, more tender, perhaps an apparent lack of evil … So we will remember them and try to keep in touch with the students who write to us. From Kathmandu we went to Pokhara, 12 hours by bus on hellish roads … I do not know if I had mentioned it before, but Nepal has the worst roads we have ever seen … so 100 km are covered in an average of 5 hours … and in addition the continuous bumpy, watching not hit our heads with the ceiling, and what to say about Nepali music … all rag, loop songs that never end … hahaha … sometimes stop a torture! 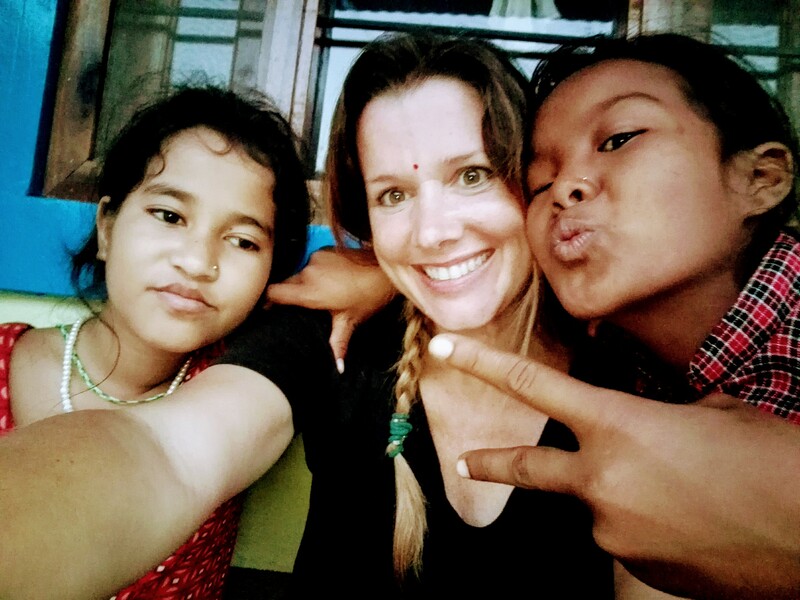 Once in Pokhara, we contacted the Butterfly Foundation. He is a Nepalese businessman who is dedicated to the hotel trade and has a foundation to help the most disadvantaged. For example, he has given aid to people affected by the earthquake. She also has a day care center where she cares and feeds children from 2 to 5 years old while their families are working. There we offered to do a 2-day workshop and a performance. They accepted with pleasure, they even invited us to stay the 2 nights in which we collaborated with them in the hotel they have with the same name. The day before we were invited to make a previous visit to see the nursery. It is an estate with a large garden, it has a 2-storey building. The floor above we did not see it, but on the ground floor they have a couple of classrooms and a covered but open area where the little ones are … they are very cute !!! For eating!!!! The next day we went there. We changed to the workshop clothes and started. All the children in a circle, we started doing a warm up … to eat them! At first some showed their shyness, others threw themselves without thinking. They loved to nibble on the palms, and when they did, they went out of their way screaming … we fed it to enjoy and liberate. After we played games and had a great time … at some point we lost control and they threw us tickle or hug … hahaha … And to finish we painted the face of animals! We made them sit on a chair while we painted tiger, lion, butterflies or ladybug muzzles. They stayed still as if they were stone, although they were content to get up and play with their new personality! We introduced ourselves and we told them that we were also clowns … it was a pleasant surprise !!!! We organized ourselves and decided that they would make an animation time for the children and then we would act. It was very fun, they pulled puppets, accordions, gave them noses of foam, and the kids had a great time. After our time came, we set a stage, everyone sat on the mats placed on the floor, and we started the show … It was fantastic! and even more for the support of the clowns with whom we share the space. Everyone had a great time. When we took the children out of volunteers, they would first be shy on stage, and then they would jump out and play with us … a gift. In the end the children were very happy! They had had a double clown session !!! And both we and the other group of clowns congratulate each other for the work done. A magnificent experience in the best company! That same night, we met again with the group of clowns for dinner. A fantastic night full of laughter, jokes and antics, magnificent people. And so we close this collaboration, with children happy to have played and felt, and clowns excited by the experience and new friendships found along the way, we are still in contact! During our stay at the Chandeswori residence we also took the opportunity to do a performance at the school with the same name. Chandeswori school is an inclusive school, that is, it is prepared to have people with special needs in its classrooms, in this case the tenants of the residence. The facilities and resources of this public school are limited, and this is also reflected in the applied teaching. There we met Steve, an English engineer who was volunteering at the school for four months, teaching English and some science. He explained that he had bought from his pocket some basic materials to do some simple science practices, very nice, a typical Englishman in the middle of the mountains of Nepal living with the local people, and part of our visit, the only western of the place . The day we accompanied the boys and girls to school we could see the classes to which they were assigned. They are distributed in different classrooms according to their level, not because of their age. 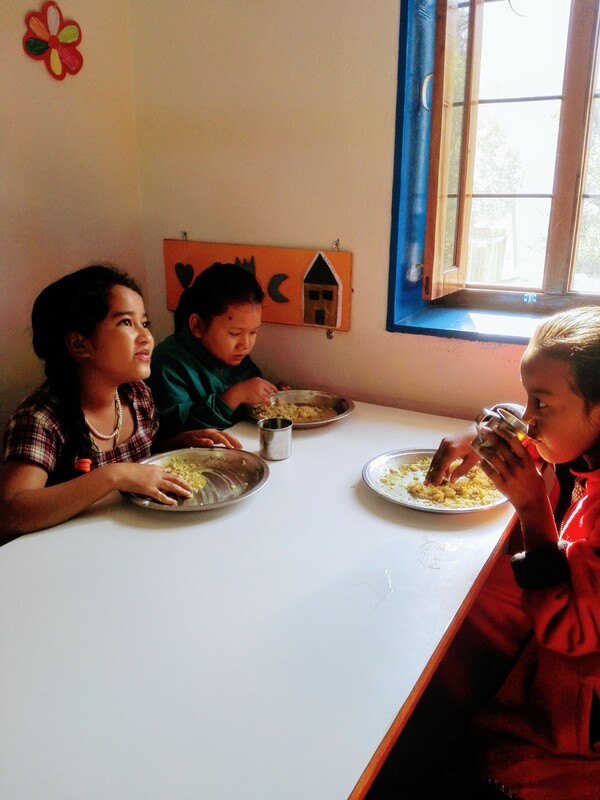 The Nepali public school has many shortcomings for all students, and these deficiencies are accentuated much more when it comes to students with special attention. 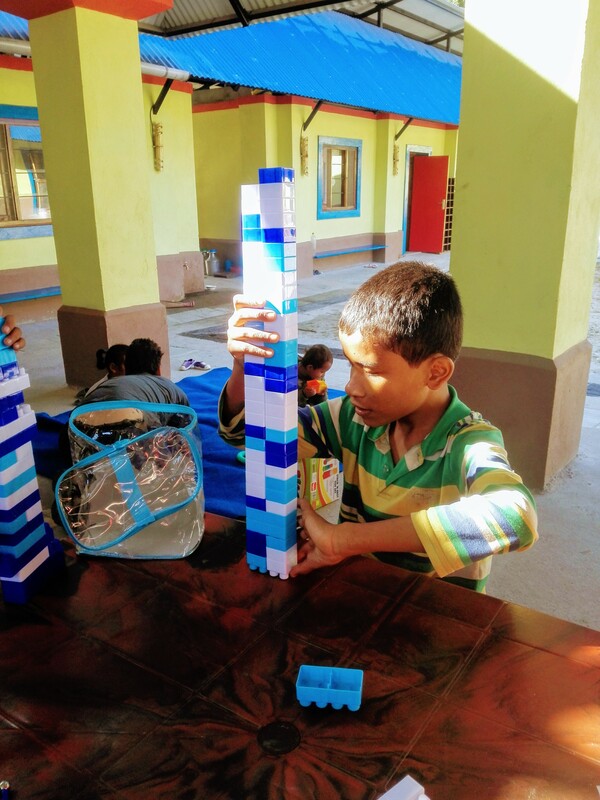 As expected, inside the school our children support each other at all times, they are a love, it was very tender to see them move in groups through the patio, hand in hand, watching not to stumble over holes and holes. 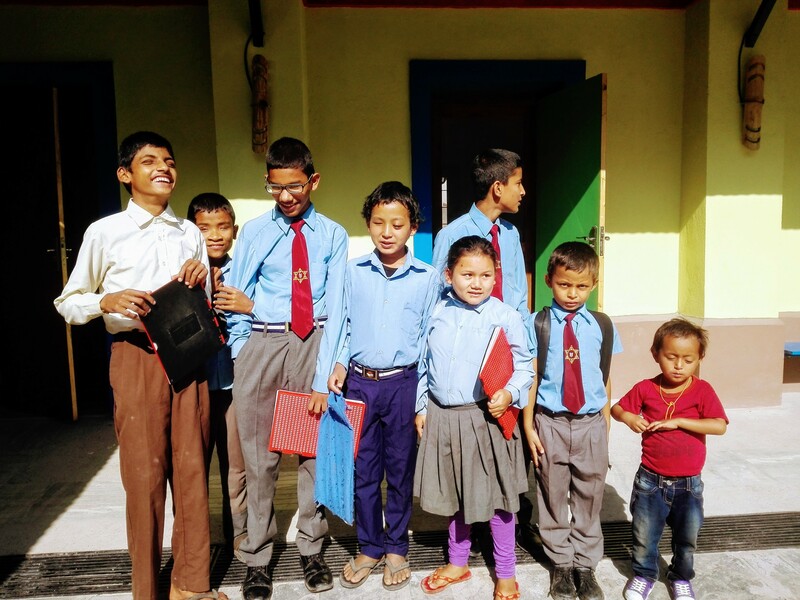 The day at school begins with the assembly, the meeting of all the students in the courtyard of the school to pray and sing the Nepalese national anthem … they are all funny in uniform, in some cases shreds, concentrating and taking out their chests. On this visit we took the opportunity to talk to the school principal, a nice and friendly man. After a walk through the town, it was time to prepare the show. When arriving at the school the only one who was teaching in a classroom was Steve, the rest of the teachers were in the staff room chatting or reading the newspaper. We talk to them to propose to start in 20 min. And after our signal, Steve started the music, to give way to the world of clowns, those tender beings who only want to share real emotions. And so it was, in front of about 200 students we showed our love, our passion for sharing, for feeling the affection of the boys and girls who enjoyed that moment with us. From the Chandeswori residence we took a bus to Lamagaun, a very small village in the mountains where the NGO Hugging Nepal is building a school. 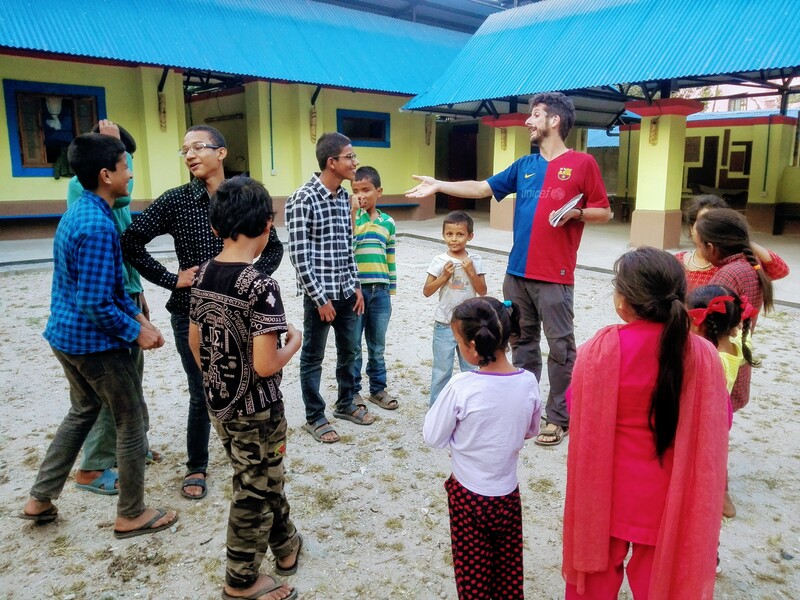 Hugging Nepal was born out of concern by a group of people, most of them Spaniards living in Nepal, who, after the tragedy of the earthquake, came together to provide direct assistance to those affected by the disaster. From rebuilding schools, homes, to providing vocational training courses and / or help in refugee camps. The bus took us to Ranipauwa, and from there we had to walk about 2 kilometers along a mud road, crossing tiny villages with people watching us as they passed by. It cost us his own to identify the “town” as it is about several houses scattered along the mountainside. Asking several people, we managed to get to the camp of the volunteers who were building the school. The first to receive us was Mire, a great woman who dedicates herself to spend her vacations working to improve the lives of other people, after we met Lucas, a very important uncle also very dedicated, and finally Alfonso, a climber who was dedicated to work in Spain to later be able to travel to Nepal, help people with their work and teaching, and do some mountain expedition. The volunteer camp was very picturesque, it was two tents covering a tents area and a long table, it was like the camp that comes out in the movies of expeditions of scientists in the Amazon … we liked it. They left us the tent of a couple who was in Kathmandu at the time. We dined in a house next to the camp, a house made of mud and stone where two old men were responsible for feeding the volunteers based on Dal Bat … rice and a soup of lentils … Look he told us he had a little bad the theme of always eating the same … hehehe … no wonder, and also the Dal Bat is quite bland … The kitchen of the grandparents was all mud, and was on the side of the room main, or dining room. The woman was cooking sitting on the floor, and we were waiting for our tray with Dal Bat sitting around her. We all dined together under the light of the fire and a lantern, they explained to us their past experiences and during their time there, and we described our trips. Very nice people that we loved to know !! The next day, everyone woke up at 6 am to go to work. We slept until 7:30, had breakfast and went to school. 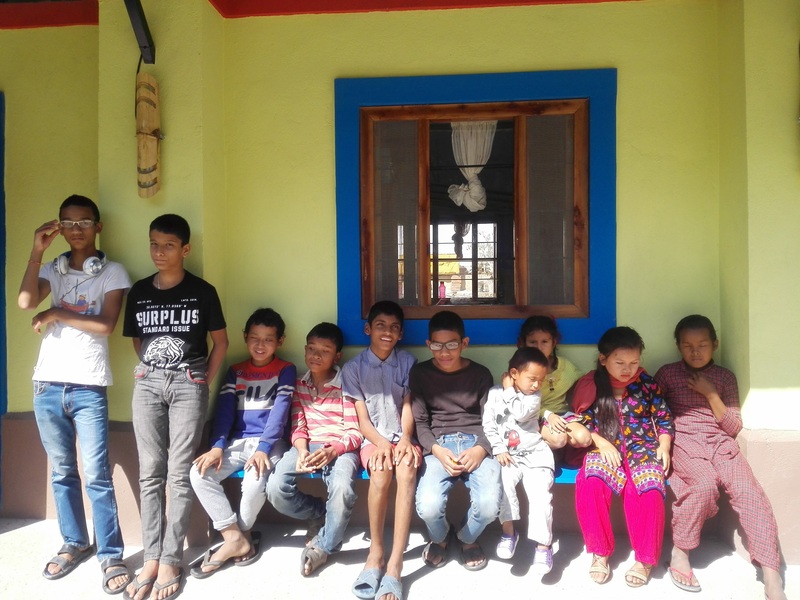 The school consisted of two parts, a temporary shack where the youngest were, and further up the road an area with two buildings restored, by the earthquake, and a building under construction. 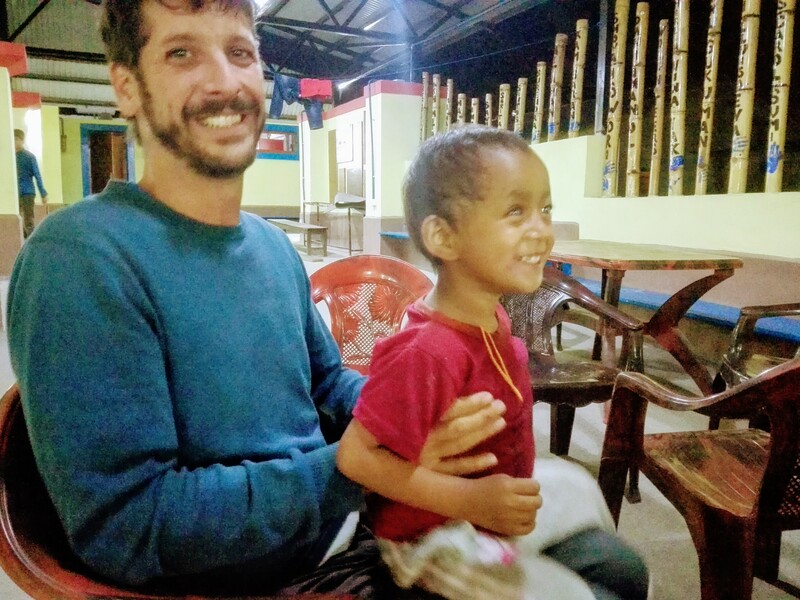 In this second zone we agree with Álvaro, one of the founders of Hugging Nepal. First we did the workshop with students from 6 to 10 years old. They were about 30 students, with faces of excitement to participate, super motivated, a taste … We started with the introductory exercises, and it was not easy … they were very excited !!! Hehehe … but little by little they were concentrating and the exercises went very well. The final part consisted of making small representations … they were super funny with their noses … representing situations … to eat them! Once finished the workshop, as always to run to prepare the number. We went down the hill a few meters to the shack where the youngest children were, there we would do the show for all the students. Alfonso helped us by acting as a sound technician and arranging for the children to be placed in the public area, already designed to be in the shade. So when everything was ready … Let the show begin! Ole Ole ole Ole!!!! From the first moment the children were condemned, motivated, willing to give everything! And after the show, the volunteers went back to their work and we picked up our things, with our backpacks on our backs, we said goodbye to our companions and we got rid of the road to Ranipawa … this time 2 km of ascent, with 17 kg in the Back, tired of the workshop and the show, it was sooooo long … but finally we got to the main street to wait for the bus that would take us back to Kathmandu. It has been a great experience shared with an incredible people … we all carry you in our hearts. And it was a pleasant news that Alfonso told us that the next day the children were repeating the exercises we had done in the clown workshop … that’s a very good sign … Ole ole ole!! The Chandeswori residence is a small house, located in the village of Tupche, which houses 12 blind or partially sighted children. This house was in charge of the Chandeswori school, hence the name, which receives government aid to support the children. The conditions in which they lived were quite precarious, they were dirty, without hygiene routines and the spaces were not adequate. Petit Món was in charge of improving conditions, rebuilding the house with volunteer architects, designing it especially for the needs of children and to optimize natural resources. The result was incredible, the house, which was reopened in August, is beautiful and perfectly adapted for the needs of children. 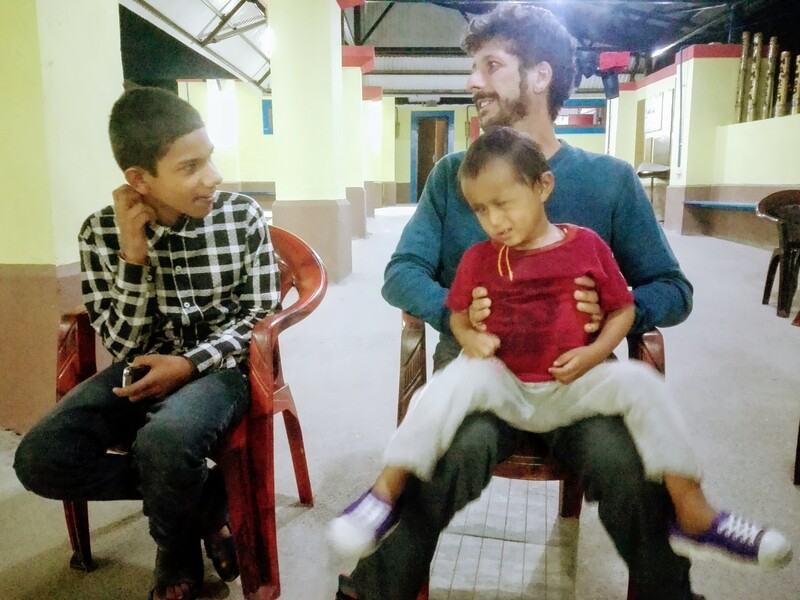 The children are adorable, at first they behaved in a shy, distant way, but as we got closer and knew everything was easier. Above all we fell in love with a person … Sukuman !!! A blind 4 year old boy, well, you can see leftovers, he was the happiest person in the world, you gave him a little bit and with that you could spend hours. Playing with him was a blast, and he went to take any small show of affection … he left us really touched … you should see him eating his Dal Bat (rice with a soup of lentils and potato) with his hand (like it is eaten in Nepal) enjoying as never before, with the look in front and removing the head of joy and pleasure. 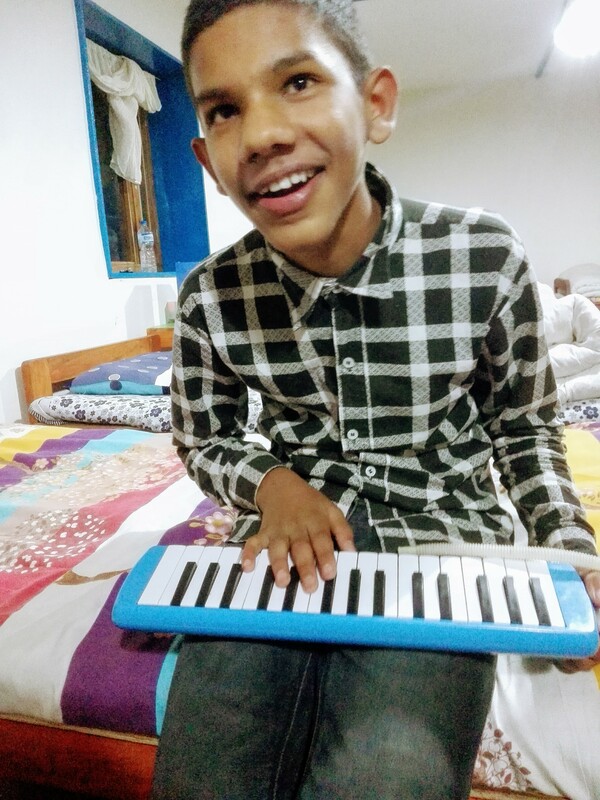 His brother, Aitaman, also blind, is very shy, almost does not speak, although he is always with the group. All the children there help each other a lot, they are a pineapple inside and outside the house … they are really a love. 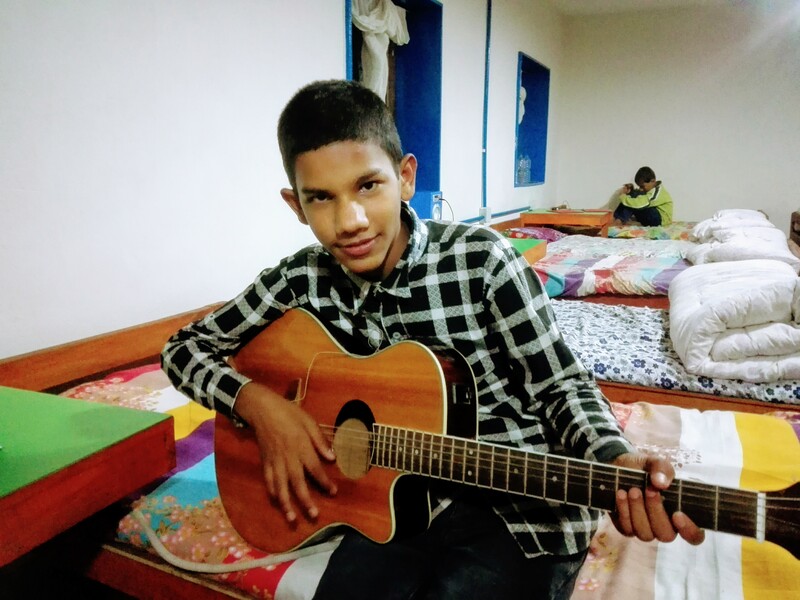 Aitaman and Sukuman sleep together at night … they are very cute … We also have Savin, Vinayak, Santosh, Inosh and Ramsaran, who are older. Savin likes to pound any instrument he finds, especially the guitar that is in the house, and the other two are more timid. Inosh had a harder time accepting us and Ramsaran is reserved but it was very close. The girls are beautiful! There is Sharmila and Iswori, with total blindness, and Ashmita who sees through an eye. 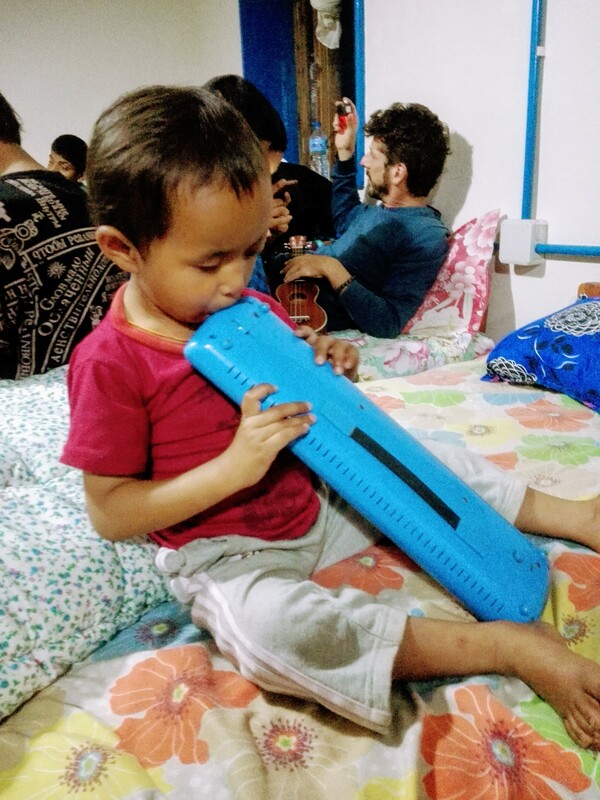 The three are the joy of the garden, Sharmila loves to sing, and she does it very well, so we did not stop asking her to sing us songs. 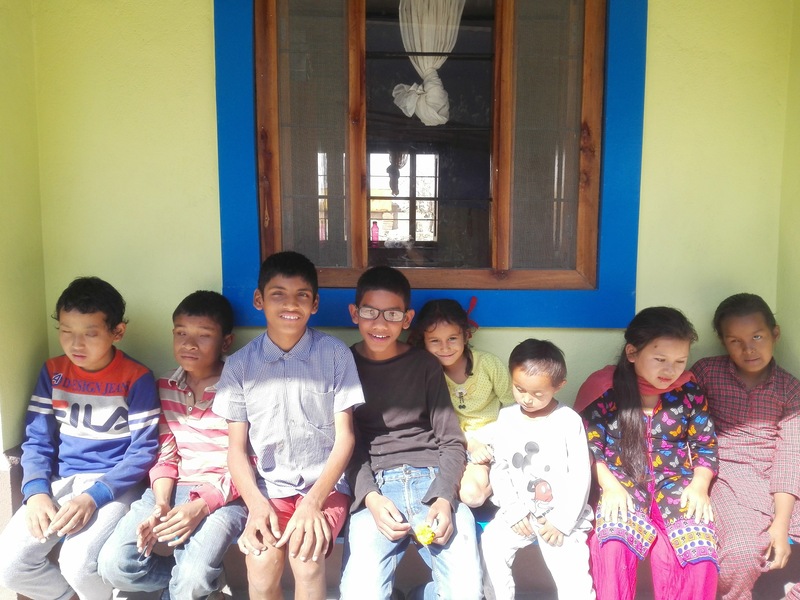 There was also Sarita, the smallest, with the most temperament, and although she did not like the physical contact, she did not stop looking for us, but when she wanted to … There’s another child in the house that we did not see, Surendra, because she had to Go to your house for a while. 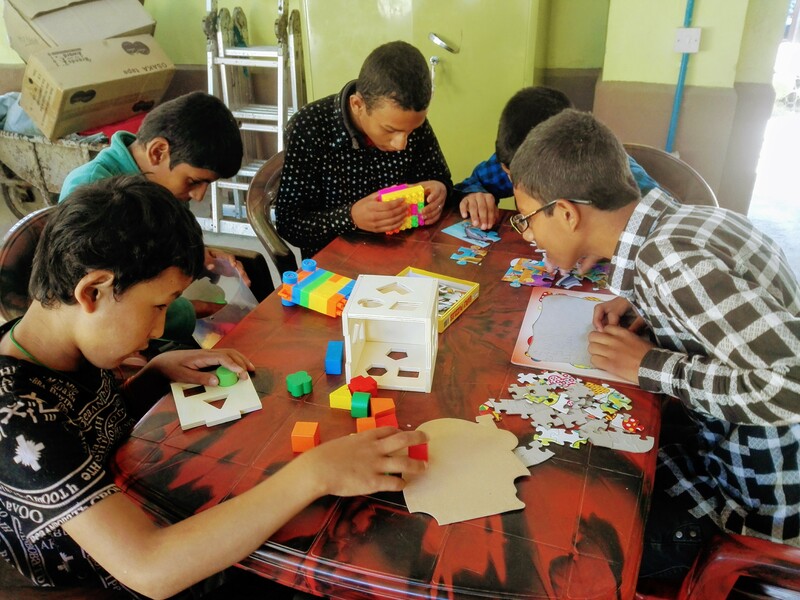 We had never worked with children with visual disabilities, but it was not difficult to make games with them, above all, of course, games in which they would dance! Then we made the game of the statues, they had to dance and when the music stopped they made a statue … they loved it and showed an imagination that was increasing as they were challenging each other. Then we played the hot potato … and so on until it got dark. You would have to see Aitaman after rejoining, giving him a little more attention, how excited he was dancing, holding hands and the rhythm of the music smiling as we had not seen so far … and the rush that occurred with the hot potato leaves that did not touch him … that bonico was! At night we continued the party in the room, dancing with Nepalese music, especially Santosh and Vinayak, giving everything, showing their best moves, even doing improvised choreography … very funny … Sukuman was throwing himself on us to do some game, Savin pounded the guitar and the rest around stretched out on the bed and commenting on the play. The next day we accompanied them to the school, there we talked with the teachers to know when we could do the performance that we explain in the next publication. We will be back. If someone would like to volunteer, this would be a perfect place !!!! You would be great and you would make 12 beautiful children happy, ask and we will pass you the contact, they deserve it! The next collaboration was very very nice. Hugging Nepal, (we will tell you about them in another post) passed us the contact of Montse, a girl from Barcelona who works and lives in Kathmandu, for the Catalan foundation Petit Món, which translated into San Neo is Sano Sansar, among many projects they they manage a shelter for children and young people without resources. 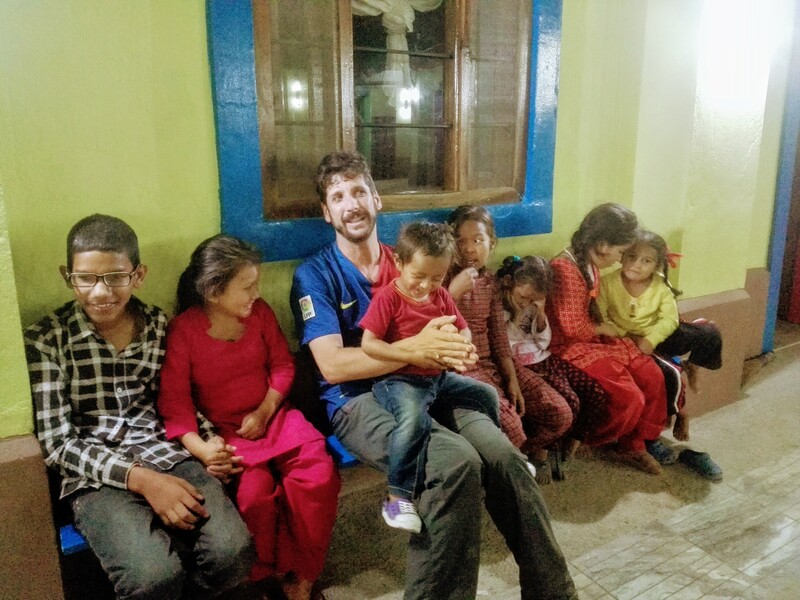 Petit Món is a Catalan association, founded by three sisters from Barcelona, ​​which carries out several projects in Nepal, India, Burkina Faso and Barcelona, ​​with the aim of improving the quality of life of the most needy groups, making sure to give them a future best. And all the projects, at least in Nepal, which are the ones we met at first hand, are managed wonderfully and above all with a lot of love and affection. The house is home to 30 children of different ages, from 6 years, Sadán, a beautiful child’s toy that you fall in love with, even teenagers like Asok, who is always making jokes, in a good mood and with an exquisite treatment, or Karen , a sensitive and kind musician … Besides those who no longer live in the house because they go to university and begin their independence, also assisted by Petit Món. 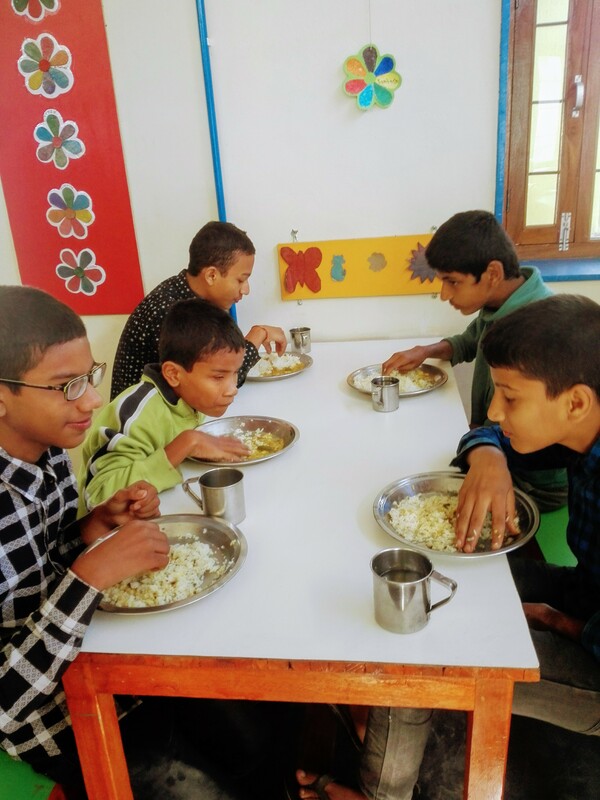 Through private donations, Petit Món provides everything they need, a well-equipped and clean home, food, clothing, all the education they want, even young people studying careers in India because they are not taught in Nepal. And also, and most importantly, they give them a lot of love! From what we saw, the biggest responsible for having so much love is Montse, a beautiful person who lives with them in the house. It makes them a bit like a mother, a friend and a teacher … You just have to go there to appreciate it. When Montse arrives at the house they are surrounded by half a dozen children and young people in search of attention, advice, permission, material or money … really, I would have lost my patience quickly … but she manages it in a masterful way. .. with immense patience … He left us in love !!! We are his admirers … This also translates into children, we feel a lot of love while we share our time with them … just being in the house was an experience of love, seriously … we do not fall in love with the environment !!! 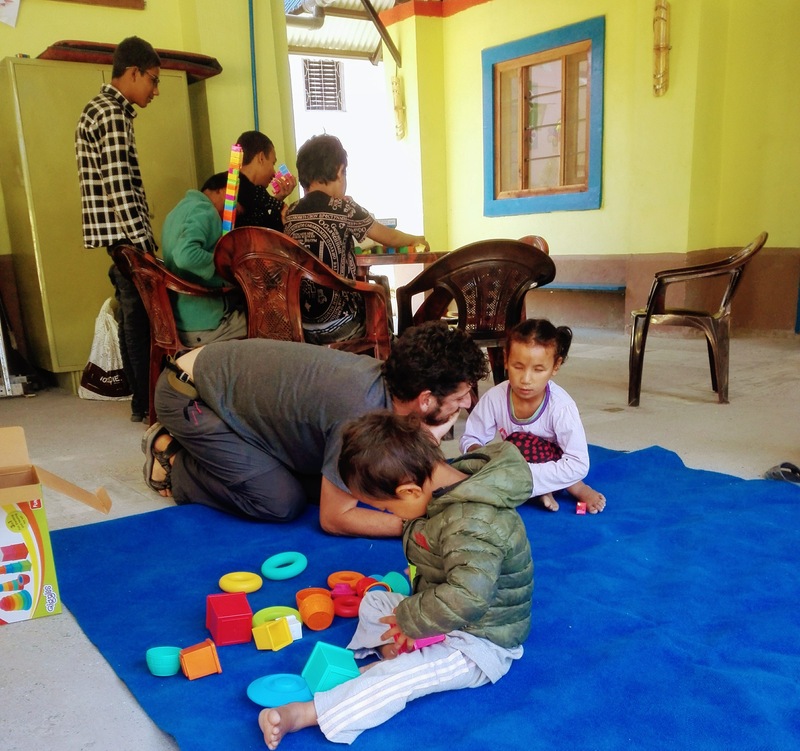 The first collaboration we did of course was at the Sano Sansar shelter. We did 2 days of theater workshop and one performance. So get to work!!!! The workshop we did with the youngest ones, which were some junk, and very funny! They had just left school, so they came wanting to party. 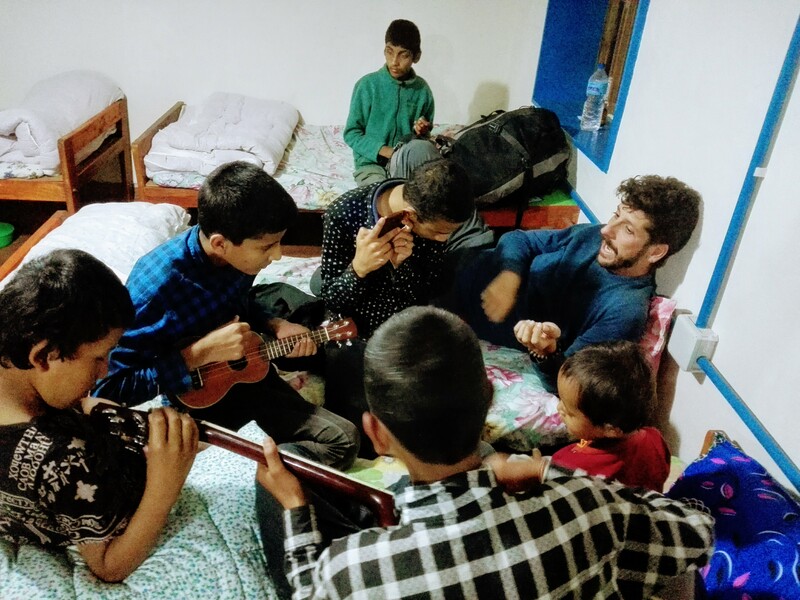 Everything went smooth, they loved the activities, being able to represent stories, show off in front of the other members of the house, imagine, create and laugh all together … They are happy and loving children! We prepared everything, the local director of the NGO, Mr. Rupak would make us sound technician and camera operator Asok … of the Gopro … hehehe … Let the show begin! As usual, they are not accustomed to seeing the type of clown we offer, less circus and more theatrical, so the first moments are stupor, followed by some laughter, to catalyze the general outburst of laughter. It was evident that they were enjoying it, we were enjoying it !!! There was no farewell because we would still be there for a few more days … We love it!!! !